The emperor Bahadur Shah (reign 1707-1712) mounted on an elephant, 1785, Bibliothèque nationale de France. The death of Emperor Aurangzeb (r. 1685-1709) marked the end of an era for the Mughal empire, after a reign of 49 years. It also initiated a renewed attempt of the VOC to reestablish their trade in India after it had suffered a major setback following Aurangzeb’s death when the trade rights, which he had personally approved, were withdrawn by his successor, Bahadur Shah I (r. 1707-1712). In this letter of 4 October 1709, Governor-General Joan van Hoorn (in office 1704-1709) requests new firmans or trading letters signed by the new emperor carrying his personal seal of approval. Such firmans were essential in guaranteeing safe passage for trade in and around the Mughal empire and they solicited immediate respect from local officials and merchants. On 5 October 1709, two ships, the Jerusalem and the Noordbeek sailed for Surat from Batavia. They carried Van Hoorn’s letter and detailed instructions for Cornelis Bezuyen, the recently appointed director of the Dutch trading post at Surat (in office 1707-1709) who was subsequently tasked with leading an embassy to the Mughal court in Delhi, 1711- 1713 (see the Resolution of 18 July 1713), to obtain the favor of the new emperor. In order to escape from the clutches of these local merchants and governors as well as guaranteeing safe access to the Mughal trading network, VOC servants actively sought support of the Mughal emperor, the highest and most respected authority on the Indian subcontinent. In 1662, an embassy had already been sent to the Mughal court under Dircq van Adrichem (director of Surat, 1662-1665), to gain the favor of Emperor Aurangzeb, and obtain firmans.5 The dispatch of such embassies to obtain imperial favor was common practice: in the seventeenth century both Aurangzeb and his predecessors had received missions from a number of European trading companies including the French and the British. Such missions were especially ubiquitous after the in the aftermath of a royal succession. Van Adrichem’s embassy was highly successful and received firmans that were declared valid for Dutch trade in Surat, Patna (Bengal) and Orissa.6 In 1689, a second embassy under Johannes Bacherus focused on Dutch trade in Coromandel, for which new firmans were needed. Although issued by the Mughal court, these firmans were not, acknowledged by the Mughal emperor’s officers in Masulipatam whence the Dutch ambassador had returned, and they were eventually declared invalid. The installment of the new emperor thus opened the door for new negotiations, hence the embassy lead by Bezuyen.7 He was assisted by two deputies: Koopman Rogier de Beerenaard, who spoke Persian (the official language of the Mughal court), and Opperkoopman Joan Josua Ketelaar, renowned for his long experience in India and Batavia and known for his expertise in ‘Moorish’ languages and customs.8 Ketelaar was fluent in Hindi, about which he wrote a grammar during his time as company servant in Surat in the 1680s. The immediate aim of the Bezuyen embassy was to obtain the favor of the new emperor and acquire new firmans, granting the VOC permission to build a new factory or logie in Surat. The cost of the embassy was projected to be high by VOC standards, but this was deemed acceptable as handing out valuable gifts to the court was essential in order to gain the favor of the emperor. Bezuyen’s first concern in Surat was thus to compile and collect the necessary schenkagie goederen or gifts. However, in October 1710, Bezuyen died after a long illness, and he was succeeded by Ketelaar, the latter’s appointment already having been envisaged in the embassy’s original procedures. Ketelaar’s embassy to the Mughal court of the new emperor, Bahadur Shah I, provides an insight into the encounter of late seventeenth-century Dutch merchants with the world of high diplomacy and Mughal court culture. It was both an exotic and bewildering encounter. After an exceptionally tough and difficult journey overland via Agra and Delhi, the embassy finally arrived at Lahore in December 1711, where the Emperor, had recently moved to visit his botanical gardens. The Dutch ambassadorial caravan contained sizeable amounts of high value goods, including gold bars, European art and curiosities, firearms, elephants, horses and other gifts. Upon his arrival, Ketelaar was warmly welcomed by two people he had been in contact with before and whom he knew he could rely on. One of them was Donna Juliana Dias da Costa, a Portuguese lady born in India, who had ended up in the harem of Bahadur Shah as one of his favorite and most devoted wives. She had become the mainstay for European envoys at the Mughal court. The other was a very powerful and high-ranking noble named Zulfikar Khan. Ketelaar carefully picked these people, as he was all too well aware of the dangers posed by the factional politics between the various Mughal princes and their supporters. These would often erupt into open violence at the death of an emperor such as had happened after Aurangzeb’s death in 1707. The embassy was officially received by an Amīr styled ‘Hattumbeeckchan’ (most likely Khadim Beg Khan) who was ordered to take care of the embassy. On 14 December, the Dutch embassy made their official entry into Lahore, the site of the temporary Mughal court. This was a real show: all members, soldiers and the carriages with gifts as well as the elephants decorated with flags, cloths and gold brocade passed through the camp and were officially inspected by Donna Juliana.9 Ketelaar’s preference for Zulfikar Khan and Donna Juliana as well as other key Mughal nobles could be discerned from the manner of the distribution of the ambassadorial gifts, a key element of any court appearance. Francois Bernier, the celebrated French visitor to the Mughal court in the late seventeenth century, had already commented on this issue of the distribution of gifts. They were of essential importance at the Mughal court, as Bernier had written in 1668 to his superior Intendant-General Jean-Baptiste Colbert, founder of the Compagnie des Indes Orientales, that “in Asia, the great are never approached empty-handed”.10 This sound advice came too late: the French Company had already dispatched a mission to the Mughal emperor, which arrived without the appropriate gifts. Arrving empty-handed, they were immediately rejected as lightweights by the Mughals.11 It was thus crucial to create the impression of liberality and generosity through the distribution of valuable gifts. Only in this way could an embassy be assured of some success at the Mughal court. The Dutch were only too well aware of this: in the Ketelaar embassy’s letter of instruction, it was advised to be sparing but not too greedy, for that ‘would lead to contempt by the Moors’,12 Therefore, the whole month of December was spent on sending gifts to the emperor, his sons and other important nobles. Bahadur Shah himself, of course, received the most valuable gifts (valued at more than 130,000 florins, (the equivalent to about 1.61 million USD anno 2014 in Purchasing Power Parity [PPP]).13 Zulfikar Khan was second in line, receiving gifts valued in sum at more than 92,000 florins (the equivalent to about 1.14 million USD in PPP), containing amongst others a valuable horse.14 Particularly striking was the value of the gifts presented to Bahadur Shah’s second son ʻAzim-ush-Shan (1664-1712), who also received more than 90,000 florins (the equivalent to about 1.12 million USD in PPP) in gifts.15 This prince was much more assertive and powerful than his brothers, but he was known to be very hostile towards Christians.16 He was also described as being very greedy, and it was believed that by sending extra gifts, done on the advice of Donna Juliana, his goodwill could be brought. Usually, a gift was refused one or two times, depending on its value, before it was officially ‘gratefully accepted’. Ketelaar appeared to be well aware of this tradition and the pecking order of how and to whom the gifts should be distributed. Thanks to Ketelaar’s prior contact with Donna Juliana and Zulfikar Khan, the enormous value and amount of the gifts distributed, he attracted the attention of the emperor, and Ketelaar received that most coveted diplomatic prize: an invitation to an audience. This audience took place on 3 January 1712. 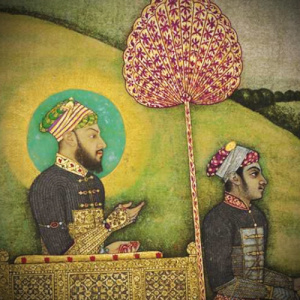 After three hours of waiting, Ketelaar was guided into the emperor’s tent by ‘Hattumbeeckchan’ (Khadim Beg Khan).17 He presented the nesser, the gift-offers consisting of gold and silver in cash, together with the credential, the letter of the Governor-General.18 These were handed to a high Amir, who handed them to the emperor, seated on his high throne with his two sons ranged slightly below him.19 Ketelaar and his assistants then each received a khilat or robe of honor, in gold for Ketelaar and silver for his assistants and a patka, a headband, both traditional gifts.20 Ke­telaar and his assistants thanked the king by performing an imperial kornus or traditional bow, four times. This was highly appreciated by the emperor; saluting an Asian ruler in the appropriate, native manner was an important way to show respect. After the first meeting, Ketelaar sent the elephants, horses and his other valuable presents to the emperor.21 Suitably impressed by these gifts and Ketelaar’s performance during his first meeting, Bahadur Shah invited the Dutch embassy for a second audience on 24 January. Still, Ketelaar was extraordinarily successful in his first month at the court. He showed the necessary knowledge and savoir-faire regarding the traditions and values of Bahadur Shah’s court. In so doing, he worked his way into the circle of noblemen close to the emperor. Unfortunately, for the Dutch, this would not providing lasting benefits for in late February 1712; Bahadur Shah suddenly died aged 59. Ketelaar now had to start negotiations all over again with his successor, Jahandar Shah, the former Prince Mu’iz̤z-ud-Din (r. 27 February 1712-11 February 1713). The bad luck did not end there. After finally receiving the firmans of Jahandar Shah in August 1713, Ketelaar returned to Surat, only to learn even before he arrived there that Jahandar Shah had been overthrown by his nephew, rendering the firmans useless. Maarten Manse, “A Letter for the Great Mughal Emperor Bahadur Shah I (r. 1707 – 1712): Courtesy and Coalition forming at an Islamic Court, 4 October 1709”, in : Harta Karun. Hidden Trea- sures on Indonesian and Asian-European History from the VOC-archives in Jakarta, document 15. Jakarta: Arsip Nasional Republik Indonesia, 2014.